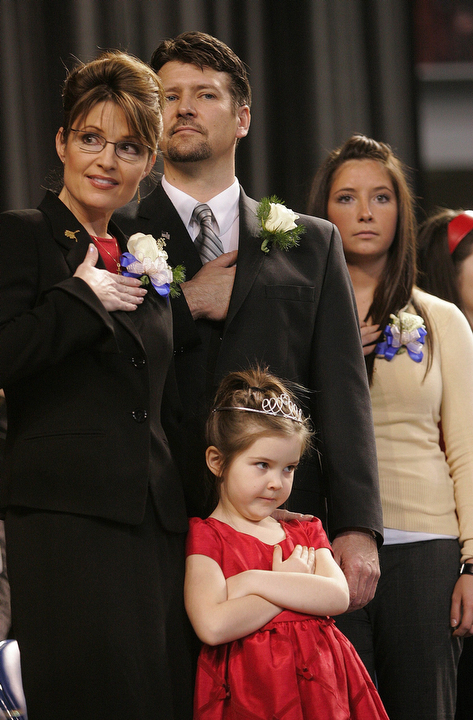 The Odd Lies Of Sarah Palin XI: Asking The Girls? Republican vice presidential candidate and Alaska Governor Sarah Palin, husband Todd Palin and two of their five children. Why does GOP vice presidential candidate Sarah Palin continue to lie to the United States voters, even about little details, that can be so easily disproved? The brilliant Andrew Sullivan examines yet another of Palin’ ongoing lies and we are left to wonder, how stupid does Sarah Palin think Americans are? PALIN: Well, I found out about the actual selection just a couple days before you guys all did. Getting that nod was quite an experience, of course, because I knew that Senator McCain and his team had been doing a heck of a lot of research and vetting of many names. So this was Thursday morning. I wake them up at 5:00 o’clock in the morning, and I said, OK, hey, we’re going on a surprise trip to celebrate your mom and I’s anniversary, 20th anniversary. So give me your cell phones. Well, why do you want my cell phone? Because I know you’re going to call people, and you might call mom and ask what’s going on. So I said, Give me your cell phones. If there’s any questions — whoever wants to ask questions is going to stay at Grandma’s house, so who’s going? So they gave me all their cell phones. And so later that day, Sarah called me — or that morning, Sarah called me and then we were on a plane south. Look: Palin can’t have taken the “two days” between McCain’s offer and the announcement to get the girls to vote on the question because a) it was one day, not two and b) because her husband and the McCain campaogn have already told us they were kept totally in the dark in the period after their mother had accepted McCain’s offer. There was no time for them to vote and no vote could have been offered. I know this is trivial, but the point is that there is a very powerful pattern here of Sarah Palin’s difficulty with telling the truth. Here we have some clear facts and chronology about events in the public record that happened only a couple of weeks ago and Sarah Palin’s stories are hopelessly contradictory. This is a pattern. She seems to have imagined a conversation that could not have taken place. And the other weird detail, of course, is her dismissal of Track’s views because he would be in Iraq “doing his thing.” In fact, an active duty soldier would have plenty of reason to be consulted about the possibility of his mother becoming vice-president. It could compromise his ability to blend in, require possible extra security protection, and perhaps jeopardize his chance to be in combat. Think Prince Harry or McCain’s sons whom he wisely keeps very much in the background. Remember she also told Charlie Gibson that she instantly and unblinkingly said yes, when asked, to John McCain’s offer for the veep slot. Either Palin lied to Gibson or she lied to Hannity. Take your pick. This entry was posted in 2008 Presidential Election, GOP Presidential Candidate John McCain, Governor Sarah Palin, US Presidential Race 2008 and tagged Alaska Daily News, Andrew Sullivan, GOP Todd Palin, Jill Hazelbaker, Kris Perry, Mark Salter, McCain campaign, Palin family, Palin lies, Republicans, Sarah Palin, Sean Hannity, Steve Schmidt, Vice President of the United States of America, vice-presidential candidate. Bookmark the permalink.